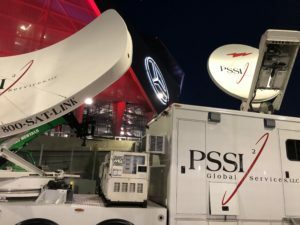 We are approaching Super Bowl Sunday, and PSSI Global Services is well-represented in Atlanta this weekend! Craig Henry has been there longer than just about anyone in the CK25 mobile teleport. By the time Craig wraps up on Sunday night, he will have spent the best parts of 10 days overseeing 26 inbound feeds and 22 outbound feeds over IP, fiber, and satellite (both C-band and Ku-band). CK25 is the routing and transmission source for CBS Sports Network’s onsite production, with interconnects between facilities in Connecticut and NYC to feed all of CBS’s many content platforms. Nice job, Craig! Just around the corner, senior engineers Rick Ball and John Bright also have their hands full with CBS’s multiple production trucks. John’s in the CK48 mobile teleport (his old friend), uplinking a mux of the main game broadcast as one of many outbound transmission paths. Rick’s in C12 providing encoding and transmission services for the disaster feed. Rick’s one of the last lines of defense in getting the game out to the world in case of power failure or other catastrophic events. John’s Ku-band antenna is also ingesting multiple inbound feeds from remote trucks around the country. This includes the live shots from the NFC hotel, where John May and Kyle Meyer are stationed in the NT26. Benny Griffis has a full camera package in his truck, and will provide run-and-gun live shots from anywhere in Atlanta at a moment’s notice. C31, live at the Fox! And that’s not all, of course. Kevin Spangler is parked outside the historic Fox Theatre in Midtown Atlanta, where this year’s NFL Honors ceremony will take place the night before the big game. Project manager Eric Hall is on hand, as well, to ensure this special event reaches NFL fans around the world. PSSI News Group is on Super Bowl duty for our friends at CNN, as well. Atlanta-based engineers Charlie Neiswenter and Lorenzo Dottori are at Mercedez-Benz Stadium in the press compound providing multiple live shots around the clock for CNN’s coverage of the big event. And make sure you watch the halftime show! DC-based News Group driver, Dustin Tanner, will be part of the drum line for Maroon 5’s performance! Good luck, Dustin! The rest of us will be watching from home (or on the road) on Sunday. Our Worcester, MA office will be pretty excited if the New England Patriots pull off another victory, while those of us at PSSI LA will be pulling for the Rams. It’s great to have so many connections to the Big Game! The rest of our team is plenty busy this week, as well. More college hoops. Rick Varney spend a frigid Wednesday night at Boston College’s Conte Forum in Chestnut Hill, MA when the Syracuse Orange were in town to take on the Eagles. Nick Ray’s going to be in the same spot in the same truck on Saturday when Notre Dame comes to town. Hopefully it’s a little warmer for Nick! Dennis Smith took the NT21 on a bit of a road trip, as he’s in Bowling Green, OH for Friday night’s game between the Buffalo Bulls and the Bowling Green Falcons on CBS Sports Network. Not far from Dennis – but far from home – Gary O’Donovan’s getting set up at Worthen Arena in Muncie, IN for Saturday’s game between the Kent State Golden Flashes and the Ball State Cardinals in a Wild Card game for the Mid-American Conference. It’s been quite a run for Gary, who finished up services for a live surgery in Kingsport, TN earlier in the week. Dave Buckman and the Columbia truck will have a full weekend. He’s at Ryan Center/Global Spectrum in Kingston, RI on Saturday when the Rhode Island Rams defend their home turf against the St Louis Billikens. From there he heads to Rose Hill Gym at Fordham University in the Bronx, NY on Sunday for women’s college basketball when the Duquesne Dukes battle the Fordham Rams. Dave “Mitch” Mitchell will be back in Morgantown, WV for women’s basketball, as the Lady Mountaineers host the Kansas Jayhawks at WVU Coliseum on Sunday. And why not a little hockey? It’s cold enough. Rick Kolinek and the K22 truck will be at BMO Harris Bank Centre in Rockford, IL on Friday for Chicago Wolves hockey when they face the Rockford Icehogs in AHL Action. Big time boxing and MMA this weekend! Tracy Michaels kicked it off on Wednesday by providing transmission services for UFC’s press conference in Las Vegas promoting UFC 235, a huge pay-per-view that will take place on March 2nd at the T-Mobile Arena. The best crew in Brazil! Before then, we’ll have yet another UFC fight in Brazil under our belts. 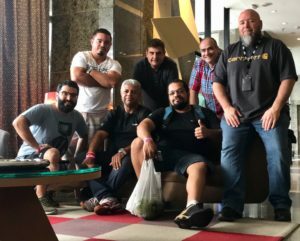 Senior engineer Jim Flowers and senior project manager Keith Valeri have made their way to the Centro de Formação Olímpica do Nordeste in Fortaleza, Brazil to join our friends from Casablanca Online for UFC Fight Night 144 on Saturday night. The main event features the bantamweight rematch between Raphael Assuncao and Marlon Moraes, while the co-feature has Brazilian legend Jose Aldo taking on Renato Moicano in a featherweight battle. We also have the weigh-in, undercards, and post-fight interviews to deliver to MMA fans around the world. Here in the States you can catch all the action on ESPN+, a sign of a new partnership between ESPN and UFC that we’re pleased to be a part of along with our friends at Concom. K18 in chilly Rochester for ShoBox. The weather’s a little different for Steve Hagerty’s fight in Rochester, NY. 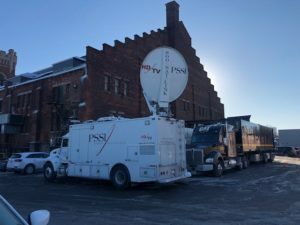 He’s there at the Main Street Armory to provide our friends at ShoBox with the satellite feed of the bout between Ronald Ellis and DeAndre Ware, as they battle it out for the vacant NABA Super Middleweight Title. Also on the fight card for Friday night, Dominic Wade faces Martin Fidel Rios for the vacant International Boxing Organization International Middleweight Title. We have a great crew assembled in Texas this weekend. Ron Ford, Larry Sheets, and senior project manager David Gallardo have all converged on the Ford Center @ The Star in Frisco, TX for Saturday’s Top Rank on ESPN boxing event. It’s an action-packed quadruple-header that features the much-anticipated rematch between WBO Light Heavyweight world title holder Eleider “Storm” Alvarez and Sergey “Krusher” Kovalev. We’ll also have Oscar Valdez defending his WBO Featherweight title against undefeated Carmine “Mr. Wolfe” Tommasone, Richard Comey versus Isa Chaniev, and the return of undefeated Lightweight sensation, Teofimo “Brooklyn” Lopez. Larry’s handling ESPN’s transmissions across multiple platforms, while David and Ron will manage the international distribution of all the action. It’s not all sports, of course. Mati Kerpen and the NT34 Sprinter will be spending a chilly weekend on a farm in rural Maine, where he’ll be doing a live shot featuring an ultrasound on a sheep to promote an upcoming show on PBS. That’s right, an ultrasound on a sheep. Dave “Mitch” Mitchell will find himself back in Punxsutawney, PA on Groundhog Day this Saturday. He’ll be set up at Gobbler’s Knob VERY early in the morning in hopes of some good news from Punxsutawney Phil. Earlier in the week, Dave Brin and Steve Chaisson along with the Starlight truck were at Heavenly Valley Ski Resort in South Lake Tahoe, CA for 2019 Operation Sierra Storm, the annual meteorologists’ convention, another event we do every year. They avoided the big snow dump this time around, thankfully! 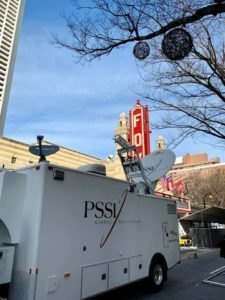 From the biggest television event in the world to a live medical procedure on a sheep, PSSI Global Services does it all. Keep watching us!